You can almost set your watch to it, the start of the TT races at the end of May often coincides with the arrival of the mighty Basking Shark or Cetorhinus maximus. These plankton eating giants typically grow between 6-8 metres in length but despite their size and appearance are harmless to humans, although care should be exercised when near them. 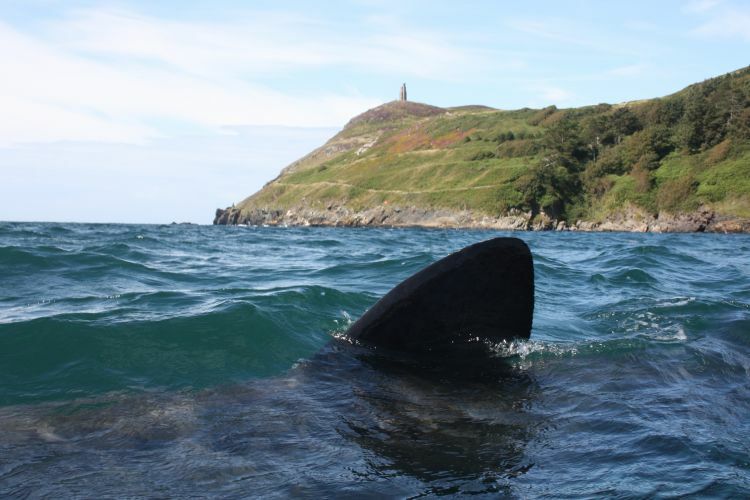 Why do Basking sharks come to the Isle of Man? The island's location in the heart of the Irish Sea positions us in the gulf stream providing a temperate year round climate. Rich plankton blooms are often found in the summer months. Plankton will be found near the surface of the water due to their need for light energy for their photosynthetic processes. It is this plankton that is the food of the basking shark. The shark has anatomical adaptations for filter-feeding, such as a greatly enlarged mouth and highly developed gill rakers. It's snout is conical and the gill slits extend around the top and bottom of it's head. As we mentioned earlier care should be exercised when you see a basking shark, but often these incredible creatures will make an approach to boats and kayaks giving those present a memorable experience. Where and when can I see them? The Basking shark is present at the surface of Manx waters from around the end of May to September and commonly found on the west coast of the island. Good viewing locations are the Calf Sound, Niarbyl and the headlands around Peel. You can also take a boat or sea kayak trip to try and get a closer view, although this should be considered an added bonus of booking one of these trips as sightings are never guaranteed. The Manx Basking Shark Watch monitors and records recent sightings. There is also plenty of useful information on the sharks, and how to safely view them without causing disturbance.